CentrikBlogsTax AdvisoryAll About GSTCheck! 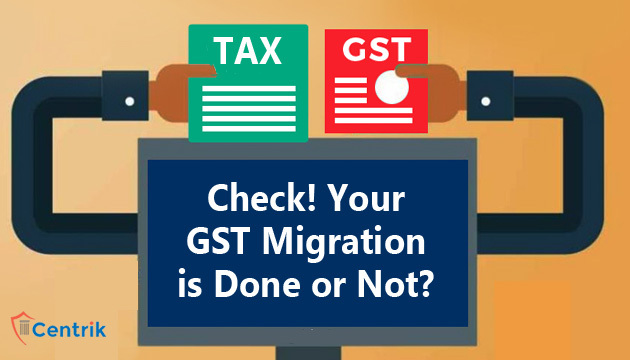 Whether Your GST Migration is Done or Not? Goods and Services Tax (GST) portal has initiated a portal to check the status of conversion of an existing registration to GST. 1. Select the concerned state from the drop down. 2. For the purpose of the reference number, ID Type needs to be selected. Taxpayers can choose from Provisional ID, PAN or Registration number. On submission, a portal will show whether the migration has been successfully completed or not. My registration status is showing submitted successfully but pending verification..I just wanted to know does it show this message for everybody before migration is complete or only for some dealers and how many days it takes for the verification to be complete before migration is done successfully. Please let me know as soon as possible. My registration status is showing ok , successfull , But still it is showing pending for verification . Ihave uploaded all my documents on 9th ,June,2017. Migration is not completed . Ihave to opt composition scheme . How can I Opt composite scheme ? While migration is not completed . Please let me know why migration is so late and what should I do to opt composite scheme ? My registration status is showing ok , successfull , But still it is showing pending for verification . Ihave uploaded all my documents on June,2017. Migration is not completed . Ihave to opt composition scheme . How can I Opt composite scheme ? While migration is not completed . Please let me know why migration is so late and what should I do to opt composite scheme ? I am also experiencing the same problem since 8th june.its showing that its 100% completed , but the status is showing “submitted and pending for verification”.How will i submit the return if my migration is not complete yet. My registration status is showing OK , successful , But still it is showing pending for verification . I have uploaded all my documents on June,2017. Please let me know why migration is so late and what should I do ?